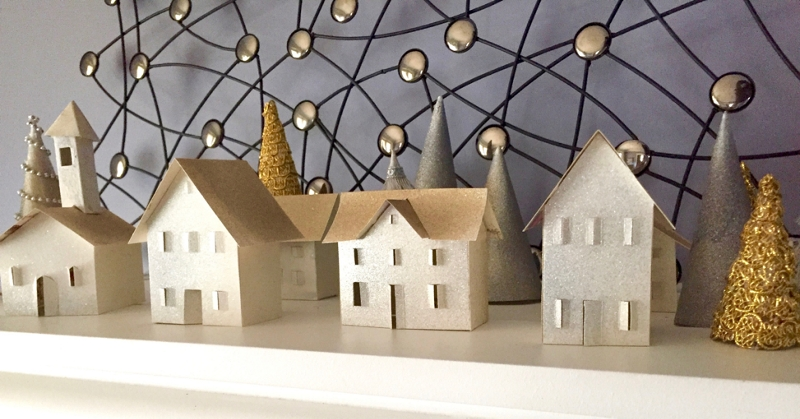 Recycle and repurpose your extra greeting cards to create a festive holiday village. Lay the first card flat on a hard surface, but keep the card folded and closed. Turn the card so that the fold is on top and the opening is on the bottom. Sketch an outline of a house in pencil on the card. Make sure to sketch symmetrical rectangular wings on each side of the house that will later be folded to create the sides of the house. Cut out the outline of the house and the wings in one piece. This will provide two identical cutouts which will allow you to create a front and back of the house. On the piece that will be the front of the house, cut slits in the shape of a capital letter "I" for windows and doors. The slits for the doors should be bigger than the windows. Fold back the small panels to open the windows and doors! Fold the wings on front and back panels of the house and glue together create a 3 D rectangle shape. Use a second card to create the roof. Lay the card flat on a hard surface, but keep the card folded and closed. Turn the card so that the fold is on top and the opening is on the bottom. Cut the roof into a design and size that fits the shape of the house. Glue the roof to the house. Cut the envelopes of the cards into a semi-circle and lay the semi-circle on a hard surface with the straight edge of the semi-circle facing up. Take both corners of the straight edge and pull them down, having them meet at the center of the half circle to create a cone. After reading can label for proper application and safety instructions, begin to paint the village using the color combination of choice. In the attached photo, Diamond Dust and Silver Flash were used on the houses, and Golden Glow was used on both the roofs and trees. Add additional texture to the trees or houses using silver and/or gold ribbon and lace.